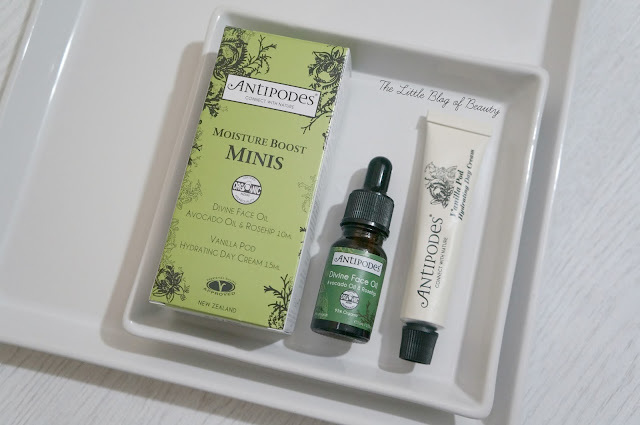 It was when I followed Renata's blog Speaking Beauty UK that I first spotted the Antipodes Limited edition Moisture Boost minis set and it immediately caught my eye. Antipodes metal tubes in gorgeous colours have always appealed to me but I'm yet to try any products from the brand. In fact it was only when I looked into buying this set that I realised I've actually been calling the brand Antipods! The set features mini versions of two of Antipodes products; the Divine facial oil (10ml) and the Vanilla pod Hydrating day cream (15ml). I think a set like this is such a great idea as you get to try a generous sample size of a couple of products before you decide if you want to commit to a more expensive full size product. The products are also the perfect size to travel with as they don't take up much space. Although I do have several facial oils, apart from The Body Shop's Serum-in-oil and balance Me's Radiance face oil, in general I tend to prefer serums at the moment. However seeing that the Divine facial oil contains avocado and rosehip oil made me want to give it a try as I believe both are supposed to be amazing for your skin. It also contains macadamia nut and jojoba oil and Vitamin E, which my skin particularly loves. The Divine facial oil comes in a pretty standard facial oil bottle with a dropper, but the mini size makes it so cute. The oil has a light green colour to it and a light herbal type scent that I actually really like (I'm not always a fan of herbal scents). I find this quite a light oil and as long as I don't apply too much my skin absorbs it well and it leaves my skin feeling, soft, smooth and moisturised. I'm not sure if this is intended to be used in the morning or evening but I use it in the evening as that's when I personally prefer to use oils. The Vanilla pod Hydrating day cream comes in one of those lovely metal tubes I mentioned above but sadly this one is just white. It's not quite as pretty as one of the coloured tubes but I do really like the packaging. Now although this is called a vanilla pod day cream essential oil fragrances of vanilla pod is one of the last ingredients in the list, so I'm not sure how much vanilla there is in there. However it does contain shea butter, manuka honey, avocado, macadamia nut and rosehip oil, so there's plenty of lovely stuff in there. It has a really nice natural (rather than artificial) vanilla scent to it with a hint of something else I can't place. Although this is a day cream my dry but unthirsty skin personally finds this too rich to be used in the morning so I've been using a small amount in the evening with the Divine facial oil and my skin has been loving it. In general my skin has been looking great while I've been using these products and has even had a little bit of a glow to it, which is unusual for my skin. I would definitely consider buying both products in full size, but to be honest the sample sizes will be lasting me quite a while. The set is limited edition and is currently showing as out of stock on the Feel Unique website (where I purchased it from) but it is still on the website so they might be getting more in. You can buy the full size products though and the Divine facial oil is £19.99 for 30ml and the Vanilla pod Hydrating day cream £27.99 for 60ml. If you pop over to Feel Unique via this link you'll get 15% off your order. Have you tried any Antipodes products?